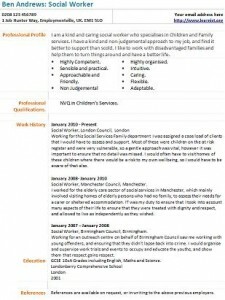 Social Worker CV example and template. Amend as suitable and create your own CV in seconds. You can apply for the job vacancies via your new CV. If you are interested in working as a Social Worker then visit the major job sites online and Council career sites to learn more about becoming a Social Worker. – If you require to write a cover letter for your job applications then click here to view example cover letters. – View Social Worker salaries. I am a kind and caring social worker who specialises in Children and Family services. I have a kind and non-judgemental approach to my job, and find it better to support than scold. I like to work with disadvantaged families and help them to turn things around and have a better life. Working for this Social Services Family department I was assigned a case load of clients that I would have to assess and support. Most of these were children on the at risk register and were very vulnerable, so a gentle approach was vital, however it was important to ensure that no detail was missed. I would often have to visit homes of these children where there would be a risk to my own wellbeing, so I would have to be aware of that also. Social Worker, Manchester Council, Manchester. I worked for the elderly care sector of social services in Manchester, which mainly involved visiting homes of elderly persons who had no family, to assess their needs for a carer or sheltered accommodation. IT was my duty to ensure that I took into account many aspects of their life to ensure that they were treated with dignity and respect, and allowed to live as independently as they wished. Social Worker, Birmingham Council, Birmingham. Working for an outreach centre on behalf of Birmingham Council saw me working with young offenders, and ensuring that they didn’t lapse back into crime. I would organise and supervise work trials and events to occupy and educate the youths, and show them that respect gains respect.